Cook & drain Pasta per instructions on the package. In a large saucepan, mix remaining Ingredients except Olive Oil, Cooking Spray, and Toppers, and simmer to a boil on a medium heat. Put your Pasta in a large bowl and spray with Olive Oil Cooking Spray. Toss a few times and spray the Pasta no more than 4 times. 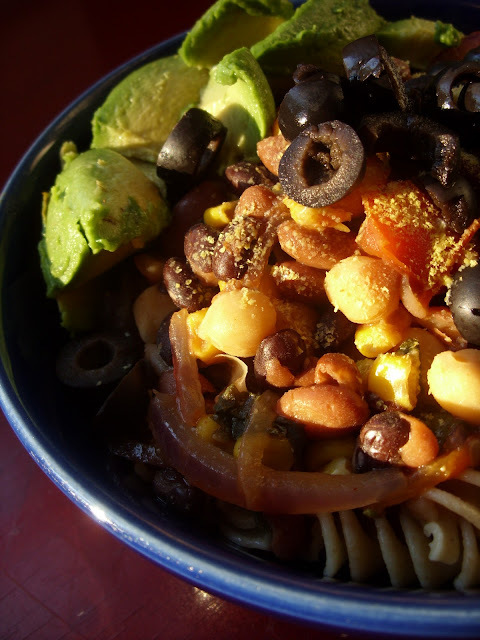 To serve, fill a soup bowl with Pasta and ladle some of the Bean Mix on top. Sprinkle on your favorite Toppers and let's party.